Vivian—single mother, modern-day Wiccan and role-playing Medieval Queen—relinquished her life plans when she became pregnant at seventeen. Now, twenty-two years later, she has lost her house to foreclosure and is still clearing rubble, hoping the Universe will show her the way. Twin daughter Guin, waitress and mom of three, is stuck in her dead-end job, living with her mother, in love with the boy she has always loved who behaves like a child himself. When it all comes to a head, she begins, unwillingly, to reconsider her life. Twin daughter Tania, idealist and feminist, thinks herself above falling victim to life's pitfalls: wrong man, accidental pregnancy, existence without plan or purpose. But she finds herself squirreled away in a window-seat overlooking the ocean reading a stack of her mother's secret diaries, juggling too many boyfriends, and finding out life is not so black and white. And each woman has a secret she holds close. With no choice but to move in with her octogenarian, staunch Catholic mother and eccentric aunt, Vivian and her daughters begin anew in the old stone house in the sand that survived a hurricane. The three generations of women gather in an old rusted screen house each dusk—the mosquito hour—to excavate the secrets of life and bridge the social norms of the years between them. The Mosquito Hours explores tender human connections, the ways by which we navigate personal crises, the interaction of mothers and daughters, friends and lovers, all driven by the interweaving of this family of women. The Mosquito Hours is about that which sustains and the ways to begin to write your own life story. 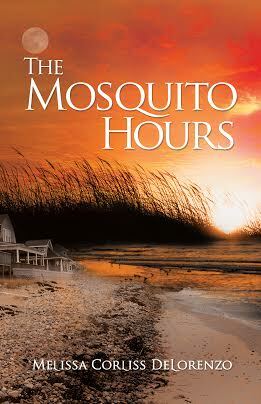 "Melissa Corliss DeLorenzo’s exquisite debut novel, The Mosquito Hours, tells the powerful story of three courageous women, struggling with the rippling effects of guarded secrets, misguided lies, and heartbreaking mistakes. Revelations add layers of meaning, deepening our understanding—and theirs, of themselves, each other, their relationships—as the novel builds toward its wise, hauntingly beautiful conclusion.